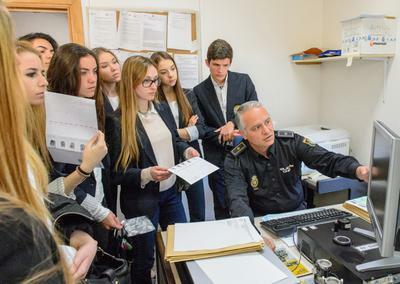 Y12 IB and AS Level Biology and Chemistry from the Science Department enjoyed a highly interactive visit at the Scientific Police department at the Comisaría de Málaga. Students were fully engaged in questions and answers as they were brought on a tour of a day in the life of a forensic police officer. Students felt part of a C.S.I scene as they saw first-hand police at work in ballistics; finger printing; chemical analysis; forgery of documentation and much more! This was a highly educational visit as students experienced the real life application of the many science topics studied as part of their IB and AS syllabus.